I’ve been craving frozen yogurt all week, I was too lazy to make my own. Having stumbled across a “opening soon” sign at Westfield Stratford I was checking the website and it seems there was a branch already opened in the UK in selfridges! After having my haircut and shopping around I made sure I went to selfridges. It is quite confusing the prices, on display I thought it would only cost me £2.90 for a plain pot. Then I had to be fussy and asked for a mix one. It was either £3 something for just the yogurt or £5.60 for the mix yoghurt with toppings. I went for a mixed flavour with toppings and asked for samples of every flavour. The chocolate taste exactly like a chocolate bar without a hint of yogurt. The pomegranate and natural was the stand out flavours for me. Its the best fro yo I had in London. The fruit used was fresh and packed with flavour, the granola was delicious. I had 2 fro yo flavours with unlimited toppings choice totally worth £5.60! I like pinkberry more, the flavouring is nicer. snog has this slight sour after taste. I shall check out your food blog soon! I lIke Snog way better – Pinkberry is all sugar and no fresh yogurt. You can tell Snog is way healthier. Pinkberry is like a Subway version. I prefer Pinkberry! need to go to snog and try their new flavours! I found Pinkberry to be much better value for money. They are more generous with their toppings and give a loyalty card. I found the flavours of both the same. 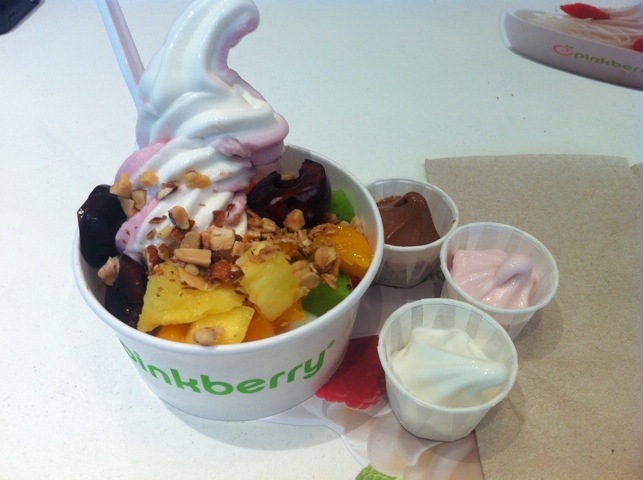 pinkberry is one of my favourites!